Last Friday we went up into Burnt Timber to get some observations in. Spotting around, we located a lot of horses up on the mountaintop; and so we headed up there. Chino’s harem was the first we saw. Nearby them were the harems of Baja, Mescalero, and Starman. The bachelors, Ferdinand, Galaxy, and Fiesta, also popped up over a nearby hill. The bachelors kept moving down in the direction of where we’d spotted the horses earlier, so we headed that way too. The bachelors ended up stopping down the hill a short distance where they mingled with Teton’s harem. The horses were definitely tolerant of each other. The first horses we saw were in very close proximity as well. Like many of the roans, Teton is darkening up as his winter coat grows in. Across the valley from Teton’s harem and the bachelors was another group of horses. Coronado’s harem was the first I came to. It’s always great to see Halcyon’s foal still alive. Halcyon’s only two years old, but she seems to be taking good care of her daughter. Nearby were also White Cloud, Custer, and Bolder’s harems. I’ve always found Custer’s winter coat coloring to be really interesting. There are definitely some harems in the mid-slope, such as Tecumseh, who was in the previous horse blog. These harems seem to be using the Burnt Timber guzzler, but they also seem to have other access to water in those areas. For example, there were pockets of snow in the forests that Tecumseh’s harem was near. As can be seen here, water is a big deal here. Though we usually associate water availability problems with the summer, it can even be a little bit of a problem this time of year. I’m not trying to cause an alarm that there will be some malnourished horses on the PMWHR this winter; I just think that it is interesting to describe the current horse distribution situation. It shouldn’t be too long before the mountain gets enough snow to push the horses off the top and down into the mid-slope, where there will also be snow available. This all also serves as a good introduction to water sources on the PMWHR; this will be the topic of my next blog post. 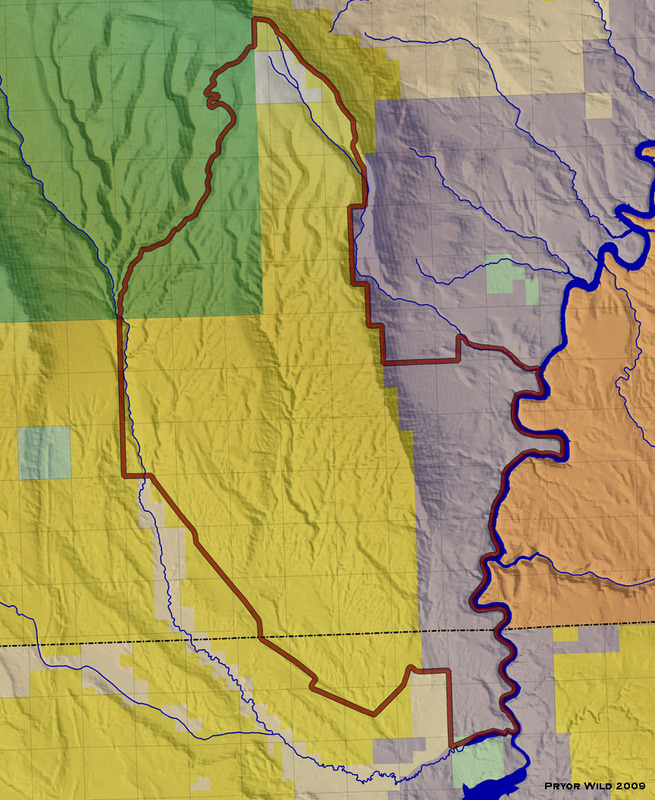 Notice how the original boundary went right along that southeastern corner of the Forest Service (green) land. This was apparently fenced. Today, there is Forest Service land in the PMWHR. 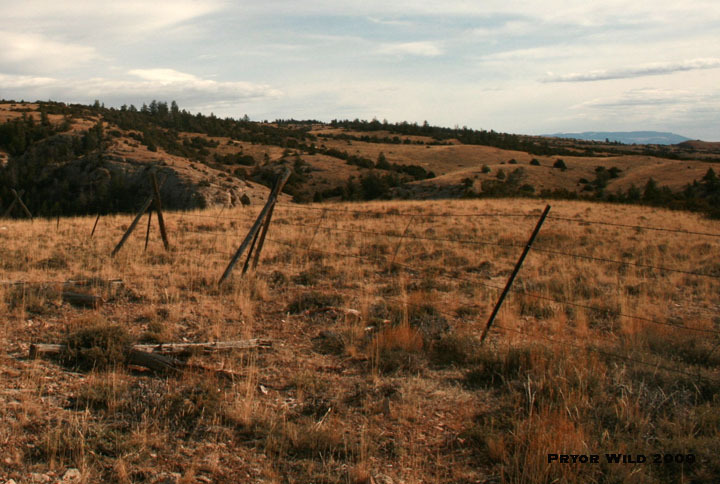 Even though this area is in the PMWHR now, there are still portions of that fence from the original PMWHR boundary present along the BLM-Forest Service boundary. The fence in this area I am most concerned with is that section running along the east-west boundary line. This fence cuts through the Burnt Timber area, which is a very large area of the PMWHR. This is an area that is underutilized by the horses, and so it is an area where we’d like to see more horse use. The fence doesn’t totally split Burnt Timber into two areas; there are some areas, especially the canyons there, that the horses are able to get through the fence at. However, it would be a lot easier for the horses to move up and down the ridges of Burnt Timber if the fence wasn’t there. In this first day of work, we were able to get almost 20% of the fence running through the west ridge opened up for the horses. We’ll just continue to do this, and pretty soon we’ll have it all opened up. In my blog post on AML, I asked the question of how AML can be raised. 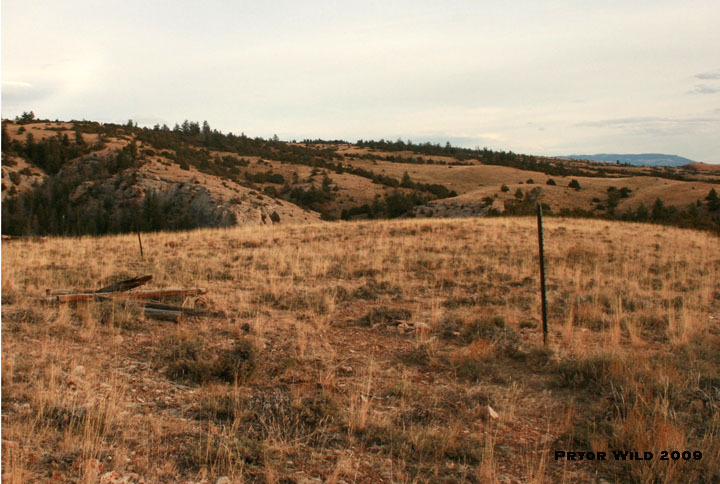 Making it easier for horses to live in underutilized areas is one way to do this. This is because it allows for a better distribution of the horses which can lead to better range conditions. I’ll discuss more specifics on living in this area in a future post. It was fun to find some horses while we were out working on the fence. This is an area that sorrel roan stallion Tecumseh often spends time in this time of year. Often I am just looking at them through a spotting scope, but it was nice being able to see them up close. Tecumseh’s foal, Jacinta, surprised me. When she was first born, she was looking like a bay to us. We thought she might end up looking kind of like her dam Rosebud. Even in September, we were still describing Jacinta as a bay. Now, though, she is looking like she could end up being dun. It’s interesting to see the progression of the colors of foals through their first couple years of life. It looks like Jacinta could turn out looking like her older half-sister Helenium. Bay roan Beulah is the fifth member of Tecumseh’s harem. Baja and his harem were nearby them, and I also found Lakota and Starman’s harems nearby. We have still been having very nice weather here, and so I’ve been able to spend some good time on the PMWHR seeing how the horses are. I look forward to going back out to work on the fence more so that the horses living in the Burnt Timber area have an easier time moving around in there this winter. Previously, I have discussed the concept of Appropriate Management Level. This is a number that describes the desired population size for different wild horse herds in different areas. When the population size exceeds AML, there are frequently management actions that occur, such as gathers and removals. Before any of this can occur, though, the population size needs to be determined. Here in the Pryors, and in other similar herds, we closely monitor the population and are able to make population size estimates that are very close to the actual population size. However, this is unusual for wild horse herds. Thus, the topic of my post today: How are wild horse population sizes determined? The widespread censusing of wild horses dates back to the passage of the Wild Free-Roaming Horses and Burros Act of 1971. Corresponding with the 1971 Act is 43 CFR Part 4700 – Protection, Management, and Control of Wild Free-Roaming Horses and Burros. This document has some more specifics on wild horse management. In Subpart 4710 – Management Considerations is a section (4710.2) on “inventory and monitoring.” Within this section is this line: The authorized officer shall maintain a record of the herd areas that existed in 1971, and a current inventory of the numbers of animals and their areas of use. (In this document, authorized officer is defined as “any employee of the Bureau of Land Management to whom has been delegated the authority to perform the duties described herein.”) So, basically the BLM was directed in 1971 to establish and maintain records of the herd areas created in 1971; and they were to continue to maintain current records on the population sizes of herds. Well, the BLM was required to do their best in making population estimates in the 1970’s; but it is hard to say how accurate these estimates were given the knowledge that existed on estimation techniques at the time. Accuracy became a big question to all as wild horse management became a bigger issue, and this was a subject of the National Research Council’s 1982 report “Wild and Free-Roaming Horses and Burros.” Starting on page 40 of this document is a section entitled “How Many Horses/Burros Are There In The West?” This section describes how studies done had indicated a wide range of possible error in censusing techniques employed at the time; attempts at censusing were believed to have missed 7% to 60% of the actual population. They had no way of determining which censuses were only counting 93% of the herd and which were counting only 40% of the herd. From this, they recommended some techniques that could be performed every 2 to 3 years to obtain the type of population estimates needed by the BLM. Notice that the new emphasis here was on attempting to accurately estimate the population size as the study had found that attempting to count everything had a lot of potential for error. Today, the science of counting wild horses is still a matter of debate and research. The BLM has stated that their goal is to obtain accurate population counts for all wild horse herds at least once per four years, but many managers seem to be making annual population counts. In an effort to develop more accurate population estimation techniques, the BLM has teamed up with researchers from the United States Geological Survey and Colorado State University. This group has done a lot of research, and they have concluded that there are four techniques that are potentially good candidates for estimation wild horse populations. These can be read about by clicking here. These techniques seek to combine field observations with statistical analysis so that accurate population size estimates can be consistently and efficiently determined. A recent publication (“Validating Aerial Photographic Mark-Recapture for Naturally Marked Feral Horses” by Bruce Lubow and Jason Ransom, Journal of Wildlife Management, 2009) describes how testing was done to determine how accurate the mark-recapture method is. This study was done in three wild horse herds that people pay a lot of attention to – The Pryors, the McCullough Peaks, and the Little Book Cliffs. Because it was done in these areas, they could estimate the population sizes for these herds and then compare their estimates to the actually known population sizes. The best estimates in the study ranged from less than 8.6% to over 2.6% of the actual size. Recall that the aforementioned National Research Council report described that censusing back then could be off by 7% to 60%. The results of the Lubow and Ransom study are thus a lot more accurate, and so these researchers feel that this particular technique has the great potential to help managers estimate the population sizes of wild horse herds whose members have many unique and visible markings. Here in the Pryors, we work hard to maintain accurate population estimates; this is one of the reasons I spend so much time on the PMWHR observing the horses. This is something many people before me have invested many, many hours into as well; I just continue to build on their work. We have a Memorandum of Understanding with the BLM, and part of this MOU regards a relationship in which we openly share our data with the BLM. We do this because we want to do as much as we can to assist the BLM in their decision making processes. My population estimates are ranges. The low end estimate reflects my known population size. The high end estimate reflects my known population size plus the number of horses that I have listed as being missing. However, given the frequency of sightings here, the probability that missing horses are actually alive decreases over time to the point where they are counted as deceased one year after going missing. Thus, my estimate range can actually be quite small; and I can even sometimes say with some confidence what I feel the exact population size is. For example, my last population estimate before the 2009 gather here was on August 31. On that day I estimated the population size to be 189 horses ages one year and up. At the same time, I had 7 horses on my missing list. Of these, one was an old bachelor who hadn’t been seen in eleven months. Two others were middle-aged mares who were found missing this spring. The remaining four were horses born last year that went missing late last year or early this year. Thus, it was probable that these 7 missing horses were actually deceased. This is why I have stated that the pregather population in the Pryors was 189 horses. The largest the population could have possibly been was 196 horses. The largest error I could have had was to underestimate the population by about 4%. 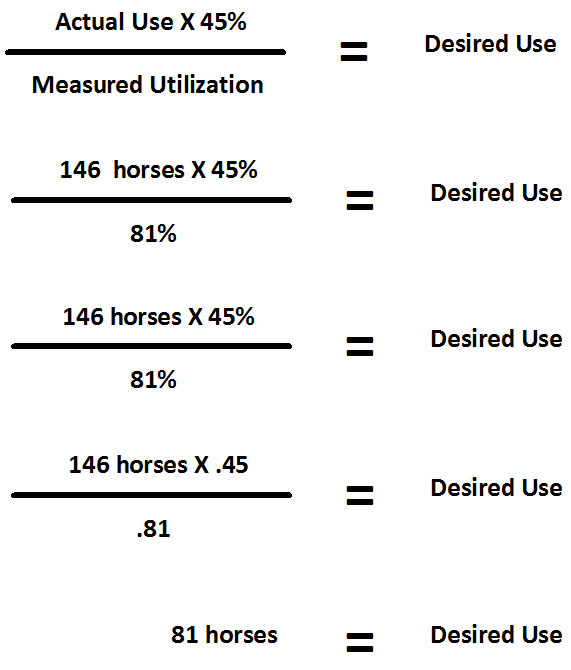 Notice that the Lubow and Ransom study discussed above concerned a method of wild horse population estimation that could estimate the population size to within -8.6% to 2.6%. This isn’t too far off from what we can come up with here in the Pryors. Our field observations here also provide us information on births, interchange, relationships, and the like. However, if it is simply a population size estimate that is needed, then it is likely that the mark-recapture method of counting horses has a lot of potential in allow for accurate estimates to occur. I think that it should be understood that past wild horse population size estimates were likely off by a significant margin. As we now know, population size is a very big factor in the wild horse management decision making process. Thus, it is very important for managers to know herd sizes as accurately as possible; and so it is paramount that accurate techniques, such as those described above, be developed and implemented. In the first blog post of my management series, I discussed the geography of the Pryor Mountain Wild Horse Range so that it is easier to visualize that the wild horses do live in areas that are a certain size that can thus produce a certain volume of resources that can support a certain number of wild horses. (Please click here to read this blog post.) With that, let’s go through what should be the most math-heavy post of this blog series. Today I’d like to focus on actual numbers; how does one define what the aforementioned “certain number of wild horses” is for a given area? This number is referred to as the Appropriate Management Level, and it is commonly referred to as AML. 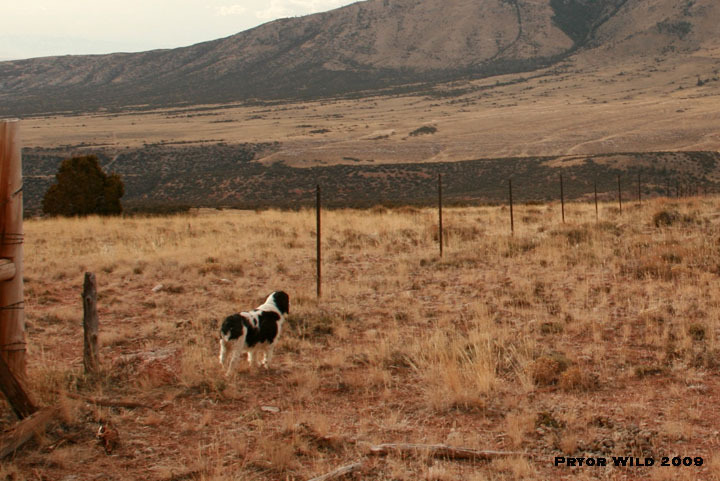 In the glossary of the BLM’s Pryor Mountain Wild Horse Range Evaluation (February 2008), there is this definition: Appropriate Management Level means the maximum number of wild horses or burros excluding the current year’s foal crop that can be maintained within an area without causing deterioration of rangeland resources. So the previous blog post walked though the concept of carrying capacity as related to the PMWHR, and all of this is basically the reasoning behind the definition of AML. So what is AML for the PMWHR? The first AML set for the Range occurred in 1984; it was determined through the 1984 Herd Management Area Plan and the 1984 Billings Resource Area Resource Management Plan. This AML was 121 adult wild horses, so from 1984 to 1992, the AML for the PMWHR was 121 adult wild horses. AML was recalculated in 1992 with the revision of the 1984 HMAP. Recall from the previous post that there was a change in the size of the PMWHR that occurred due to the loss of National Park Service lands; the result was a smaller area. Because of this, AML went from 121 adult wild horses to 95 plus or minus 10% horses. Thus, starting in 1992, the AML was 95 to 105 wild horses. Due to concerns over the herd’s genetics, recommendations were made in 1994 to not bring the wild horse population down below 100 individuals one year of age and older plus that year’s foal crop. This is basically why the population was always floating around 140 individuals from 1992 onward into the early 2000’s. However, AML was still legally 95 to 105 wild horses. I learned of this information from an interesting discussion of Appropriate Management Level that was included in the BLM’s Environmental Assessment for the 2001 roundup. The AML of 95 to 105 wild horses was still in existence until recently, when the BLM developed a new Herd Management Area Plan. This HMAP will reset AML at 90 to 120 individuals one year of age and older plus that year’s foal crop. The target population size is the high end of the range, 120 individuals plus that year’s foal crop. So now we know what AML means and what it is for the PMWHR, but how is it determined? 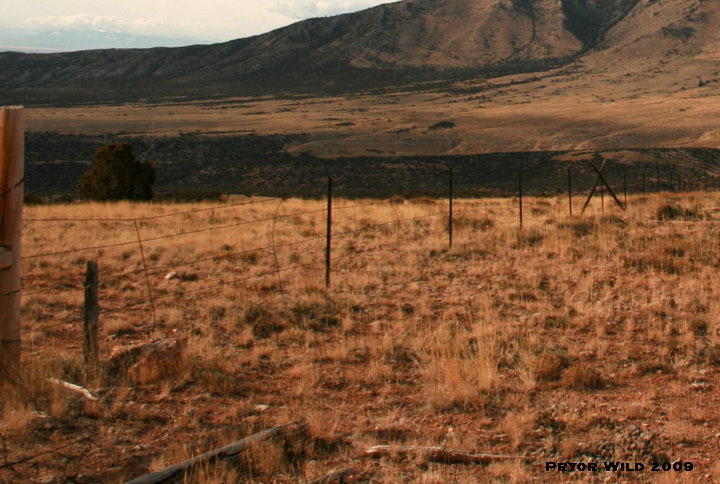 In the BLM’s Pryor Mountain Wild Horse Range Evaluation (February 2008), Staff Technical Recommendations section B as well as Appendices VII and VIII go through the actual calculations that led to the determination of the current AML. The formulae used in the following calculations come from BLM manuals on rangeland evaluation. The average of the values from all those years was then taken, and this average is 92 horses. Thus, according to this calculation, from 1995 to 2006 there should have been an average of 92 horses on the PMWHR each year. This was rounded down to 90, and this is where the AML’s low end of 90 horses comes from. 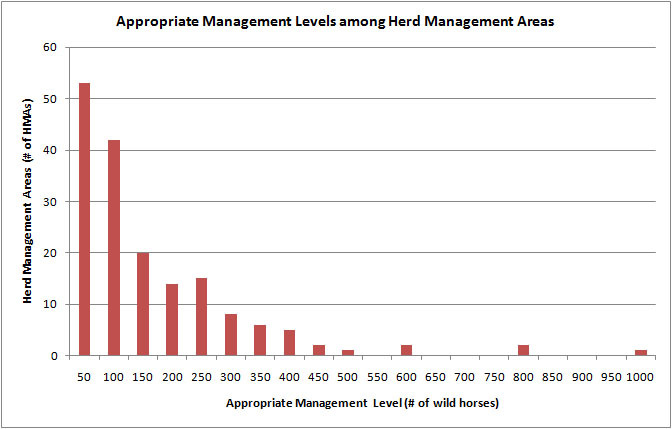 Remember, this was determined only from observations on the wild horse population and the observed forage utilization for the years 1995 to 2006. There isn’t a big difference in the results of the two calculations for 1995. This is because 1995 experienced just below average precipitation. Lower precipitation yields higher values for desired use. This is because lower precipitation leads to lower forage production. 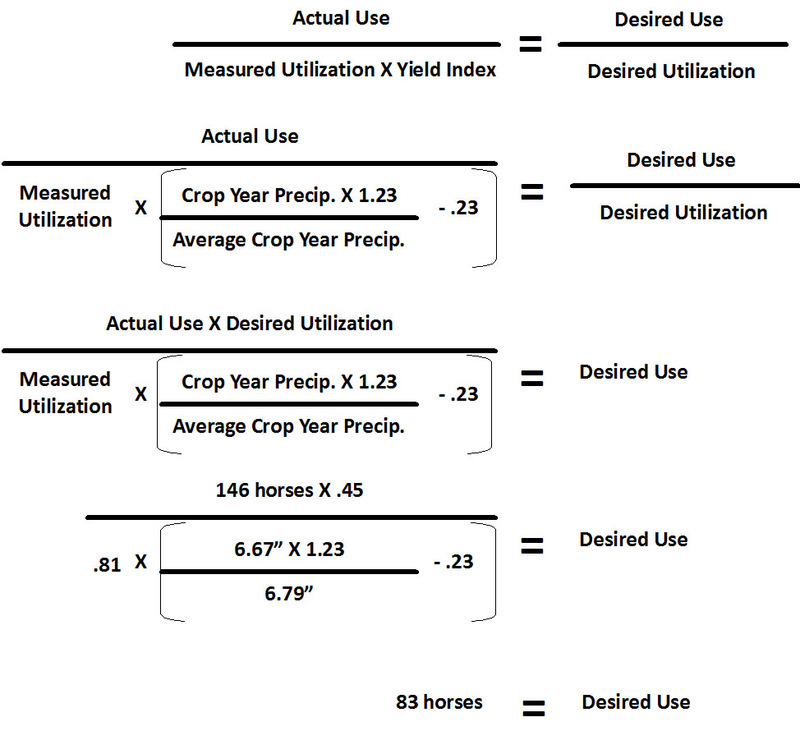 If there is lower forage production, then actual utilization is more heavily influenced by a combination of precipitation and wild horse grazing than wild horse grazing by itself. The year 2000’s low end desired use result was 95 wild horses. However, 2000 was also a year with below-average precipitation. Because of this, the high end desired use was calculated to be 151 wild horses. When the average for these values was taken, it was determined to be 117. This was rounded up to 120, and this is where the AML’s high end of 120 horses comes from. When and how can AML be raised? After all, a larger herd size is a definite goal here and in many other herds. How will AML be reached? We’ve seen how the 2009 roundup was used to move the herd size closer to 120, but roundups aren’t the only way to manage a wild horse population. These are the topics of upcoming posts. This post and the previous one have worked toward establishing the scientific and legal reasoning behind management. Future posts will focus on actual methods of management. Thank you for taking the time to better understand AML!